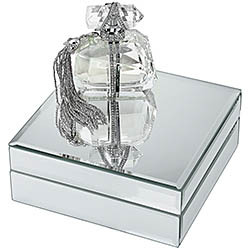 Check out the NEW fragrance Marchesa Parfum D'Extase Awards Season Couture Edition. A gorgeous bottle design and great powerful perfume to add to any collectors collection. ntroducing the limited-edition Awards Season Couture Edition of MARCHESA PARFUM D'EXTASE. This exclusive set from the celebrity-beloved brand is just in time for the red carpet. Adorned with a dazzling crystalized chain tassel and encased in a mirrored box, this couture edition was designed for every girl's MARCHESA moment. With only 150 made, each one has been individually numbered for authenticity. Now you can experience the red carpet magic of MARCHESA. MARCHESA PARFUM D'EXTASE opens with light florals, giving way to a combination of fresh and sensual notes that create complexity and beauty. Iris is the secret to the fragrance's richness, capturing the delicate essence of its flower petals and the dark sensuality of its precious roots. Freesia, young violet leaves, night blooming jasmine, ambrox, and musks complete the sublime composition of this intoxicating elixir. The fragrance's elegantly designed bottle evokes the look and feel of an exotic raw crystal, a powerful gemstone known for its positive energy and abundant healing qualities. Each bottle features individually set crystals that exude confident and alluring femininity signature to MARCHESA. Discover the designers’ enchanting vision and dress your senses in ecstasy.